Good morning, dear readers, and happy hump day! I apologize for this post taking an extra couple of days. There are a couple things going on in my personal life that needed some attention, and as much as I could have used the blogging as a distraction, sadly I just couldn't focus on it. After a few days of bad sleep, the hubby convinced me to go to bed early last night, and do I feel much better today! I guess this is just my little reminder that when things are going crazy in life, try to not neglect your sleep; it certainly helps you cope better with whatever difficult things may be going on in your life. 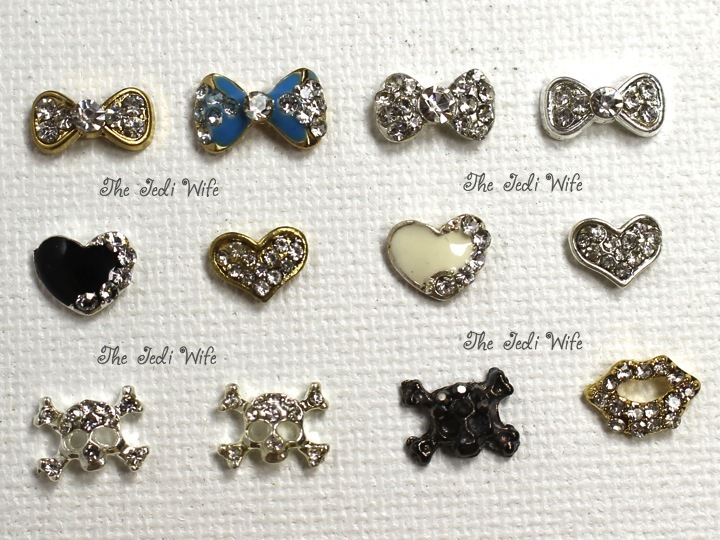 For today's post, I have these cute metal charms from Born Pretty Store to share with you. They arrived in a pack together, and I love that there were several options to choose from! I also like that there were both yellow and white metal options within the same pack- it's perfect regardless of whether or not I am in a silver or gold mood. I wanted to show off two of these charms with you so you could see how large they are on the nail. Sometimes you just don't have a lot of time to do fancy nail art, but you want something a little fancier than just a couple coats of plain polish. 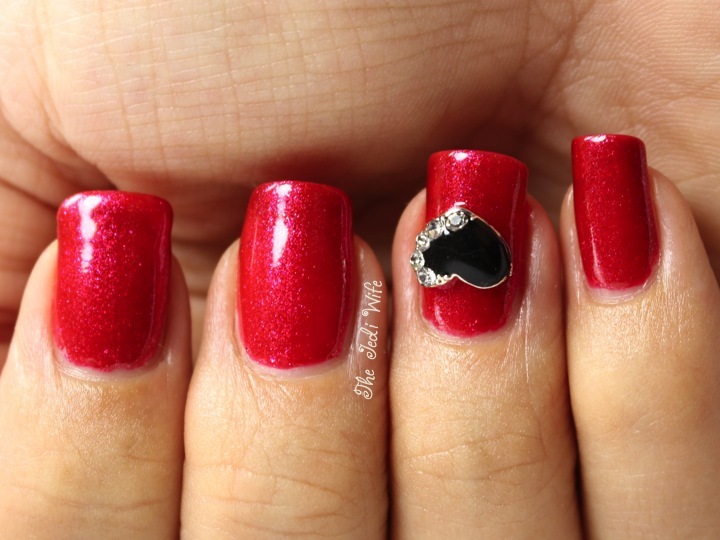 I added this cute black rhinestone-edged heart with a simple red nail (Zoya Tori) with a small drop of nail glue. I love that it adds a nice glam touch to the red with just a couple seconds! I had already had the plain gold polish on my nails (Literary Lacquers Mr. Darcy from gloss48), and I wanted to jazz it up a little for a little longer wear. 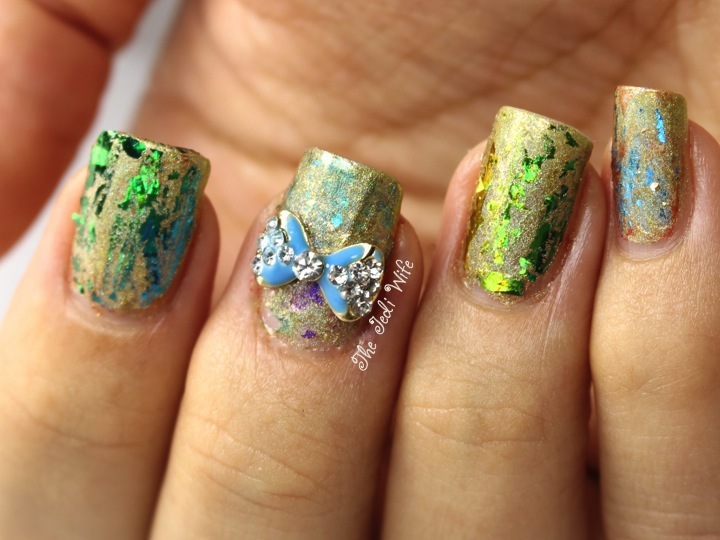 I added a little touch of nail foils that I reviewed previously before adding this cute bow. I'm not loving the final outcome of this mani, but don't let that deter you from this cute charm! I was quite happy with these metal charms! They each had a nice curve so they could lie perfectly across my nail. The only downside to it is it does limit how these charms fit on the nail; you cannot put them on at an odd angle (which I personally love to do) without them sticking out and not well onto your nail. They came off easily with a little bit of acetone flushed underneath the charms, and they can be set aside and used again. I would definitely recommend these to others, and I want to get some more to play with! The direct link to purchase this set of charms is here. While you are there, check out what else Born Pretty Store sells so suit all your nail art needs. You can also save 10% of your order by using code QWL91! EDIT: It looks like these charms are no longer available in the set that I received. I was able to track down the bow and the heart charms though, and they are now available for individual purchase here along with several other options. Until next time, dear readers, have a wonderful day! XOXO! born pretty has some amazing nail charms! I love the charms from Born Pretty! The bow is so cute!